A team of scientists from Columbia University and MIT is studying the city’s cyclone risk. What would happen if a Category 5 cyclone with wind speeds of over 250 km per hour were to come bearing down on Mumbai, a city of at least 1.83 crore people which has never seen a storm of that scale before? That is the question a group of researchers at the Columbia Global Centre in Mumbai is trying to answer. The team – led by Adam Sobel, an atmospheric scientist at Columbia University and author of a popular science book about the aftermath of Hurricane Sandy, a massive storm that hit New York City in 2012 – is studying the probability of a cyclone hitting Mumbai and mapping possible flooding patterns after the storm in order to help city planners plan for the contingency. Cyclone, hurricane and typhoon describe the same weather phenomenon but occurring in different places. The idea for the study came from the writer Amitav Ghosh, said Sobel, who was in Mumbai last week. While working on The Great Derangement, his new book that tackles the subject of climate change, Ghosh had written to Sobel asking what he thought might be the impact of a storm similar to Hurricane Sandy hitting a city like Mumbai, with specific reference to storm surge. A storm surge is when storm winds push seawater above normal tide levels, flooding the coast. Sobel had worked on a World Bank project forecasting cyclones for Bangladesh and was familiar with cyclones in the northern Indian Ocean. Cyclones are rarer in the Arabian Sea than in the Bay of Bengal, although climate change could alter their frequency. 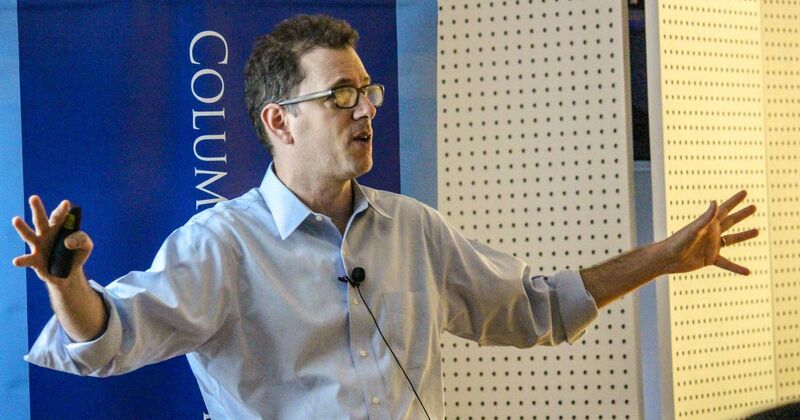 When Sobel heard that Columbia University had a global centre in Mumbai that would fund the research, he applied for a grant from Columbia University President’s Global Innovation Fund for a small project in the city. The project started in June 2016. Other members of the team include Suzana Camargo, Chia-Ying Lee, Kyle Mandli, Michael Tippett and Zachary Burt, all of Columbia University, and Kerry Emanuel, a leading meteorologist and climate scientist at the Massachusetts Institute of Technology. Will a cyclone really hit? Although there are more hurricanes in the Atlantic Ocean than in the Arabian Sea and some of those even skirt New York City, it is unusual for them to majorly affect the city itself, Sobel said. There had not been an event like Hurricane Sandy for 200 years. Mumbai too has never been directly in the path of a cyclone – as yet. A story of a cyclone hitting the city in the 19th century turned out to be a hoax. 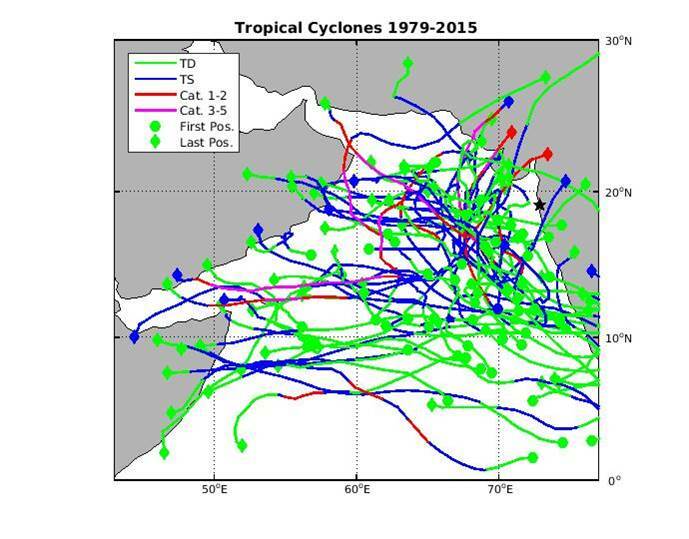 Most cyclones in the Arabian Sea tend to move northwards and make landfall in Pakistan or Gujarat. They do not ordinarily move eastward towards Mumbai. This does not mean Mumbai is not at risk. Sobel’s team has developed a forecast model called the Columbia Tropical Cyclone Hazard Model, using current and historical meteorological data to calculate how future storms might behave. Using the model to simulate the next 20,000 years of cyclones in the Arabian Sea, they found that of the strongest 32 storms – Categories 3 to 5 – some did pass through Mumbai. Climate change might also increase the odds of a cyclone hitting Mumbai; the team’s simulation does not for now account for rise in global temperatures. A 2017 study by Hiroyuki Murakami and others at Princeton University shows that the probability of post-monsoon cyclones in the Arabian Sea has increased since 1940. Human interventions in climate have influenced this change. The Columbia team’s model is based on one developed by Kerry Emanuel. Sobel compared them both to the models used by the insurance industry to calculate probable risk based on past information. The tropical storm models know where on the earth the storms is, its path and its intensity. They also know the climatic environment, including temperature, humidity and sea surface temperature – all large-scale environmental variables that make a hurricane more or less likely to form or intensify or move in a certain direction, Sobel said. As this is a global model with information about tropical storms around the world, this makes scanty data from the Arabian Sea less of a problem. 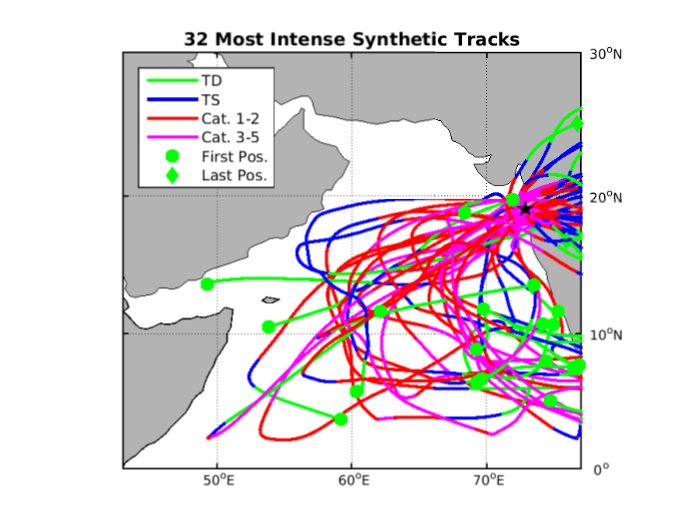 This image from the India Meteorological Department shows observed and forecasted tracks for Cyclone Ockhi on December 3. 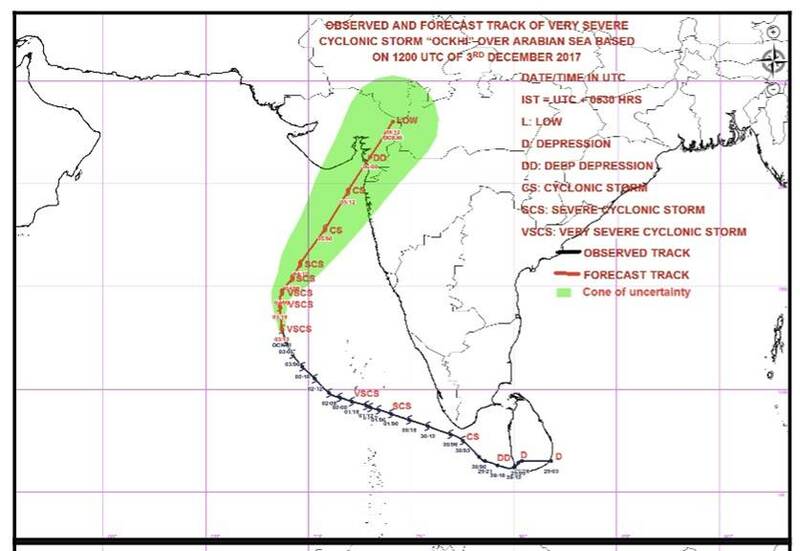 The green cone shows possible tracks for the cyclone, part of which includes Mumbai. Cyclone prediction is just one part of this research project. The other part is calculating a cyclone’s possible impact on Mumbai. For this, the team needs to calculate the impact of storm surge, when strong winds push sea water several feet above the tide line. This fast-moving water is often the most dangerous aspect of a storm to those living along the coast. Mumbai is, of course, no stranger to flooding but it remains acutely unprepared for the heavy rains that cause it. For instance, only 28 of 58 projects in the ambitious Brihanmumbai Storm Water Drainage plan have been completed in the 12 years since the worst flood in the city’s history. Meanwhile, as urban encroachment on mangrove areas, which could absorb the excess water, continues unchecked, even little rainfall causes flooding in low-lying areas. The pattern of flooding from a cyclone will be slightly different from that of a storm surge, Sobel said. The areas along the coastline will be at risk the most, with the eastern suburbs of Navi Mumbai particularly vulnerable. 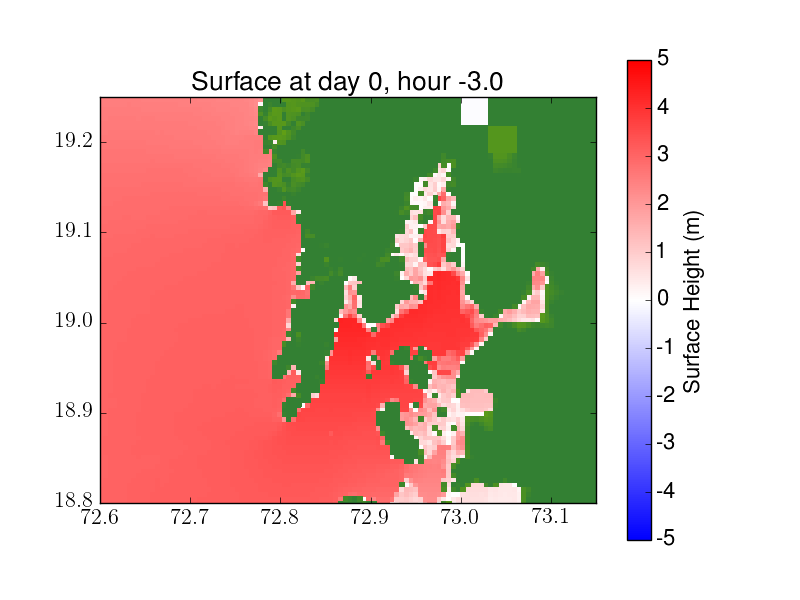 This simulation, Sobel said, does not account for the possibility of the storm striking at high tide, which could increase the area inundated. It is thus not a worst-case scenario. These are just preliminary results from ongoing research, Sobel said, not final or peer-reviewed, and indicate the risk to the low-lying eastern areas on both sides of Thane Creek. This data is available with the Disaster Management Cell of the Brihanmumbai Municipal Corporation, but they cannot share it – with even Indian researchers studying flood risk – because it is controlled by the defence ministry. So, for now, the research team has to use publicly available data that is not entirely accurate.